Please Note: Event will be held at the Little Red Store on Harwood Ave., NOT at the Wauwautosa Co-Op location. CUB and Outpost Natural Foods invite you to attend a 30 minute talk by CUB’s Executive Director Thomas Content. 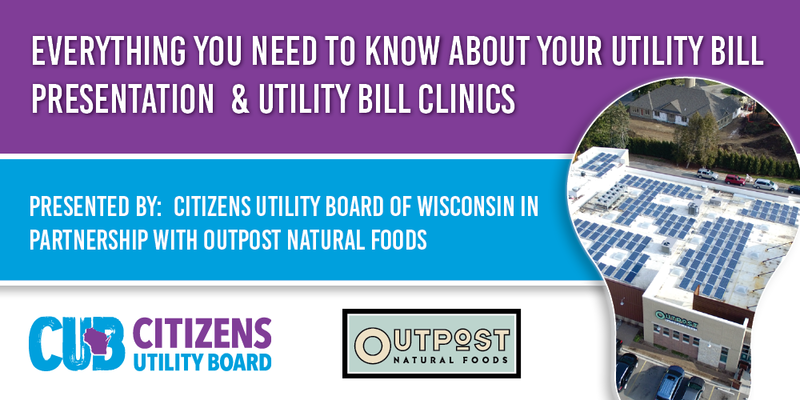 You are also invited to bring your utility bill and schedule a time at the utility bill clinic. Enjoy complimentary refreshments and then listen in on the 30-minute presentation. Free Utility Bill Clinic: Sign up for a 15-minute time slot to speak with a knowledgeable CUB staff member with questions about your utility bill. Time slots available after the program. What will happen to We Energies rates, already 7th highest in the Midwest, this year? How much of an increase is in the works? What will it mean for customers with solar panels? Why is my utility bill so confusing? CUB will be there to explain. How do I keep more in my pocket? CUB will be on hand to explain everything, including information on energy saving resources and options!